The Nvidia GeForce 9800M GS is a graphics adapter for laptops and based on the G94 core with 64 shader processors. The chip is produced in 55nm (as the 1024 MB versions of the 9800M GTS and the GTS 160M). Because of the max. 512 MB GDDR3 the TDP is lower (60 Watt) than the 9800M GTS (512 and 1024 MB version: 75W). Because of the additional shaders but lower clock speed than the GTS, the 9800M GS is between the 9700M GTS and 9800M GTS. Therefore, DirectX 10 games of 2008 should all be playable in medium to high details. As all cards with DirectX 10 capabilities, the GeForce 9800M GS renders the 3D images using "Unified Shaders". There don't exist any more dedicated pixel- and vertex shaders but 64 so called stream processors make the graphic work (which has been done by pixel and vertex shaders in former days). Furthermore, the shader units are higher clocked than the chip. An advantage of the GeForce 9000 series is the integrated PureVideo HD video processor. It is able to help with the decoding of H.264-, VC-1-, MPEG2- and WMV9 video material in HD quality and eases the CPU. In conjunction with the Nvidia 9100M G integrated graphics, the 9800M GS supports Hybrid-SLI (only HybridPower). HybridPower is a technique to choose between the integrated and dedicated graphics core, if performance or battery runtime is needed. This works only in Windows Vista. Up to now the user has to use a tool to switch between the GPUs. Later Nvidia wants to switch automatically in the drivers. GeForceBoost is not supported with this card, as there would be no performance gain to combine the integrated GPU with the 9800M GS. Compared to desktop graphics cards, the 9800M GS should be a bit slower than the GeForce 9600M GT. 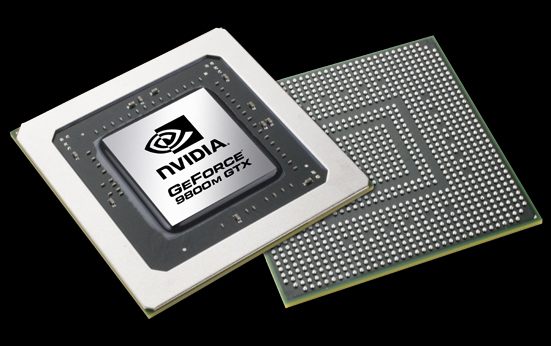 The Nvidia GeForce 9800M GTX is a graphics adapter for laptops based on the G92 core. In general, the GPU is similar to that of the 8800M GTX but with 112 unified shader cores instead of 96. The chip is manufactured in a 65nm process and because of the high shader count, the power consumption (75 Watt of the MXM board) can be quite high. As a result, the 9800M GTX is only found in larger laptops with relatively powerful cooling solutions. The performance of the chip is noticeably better than both the 9800M GT and GTS because of the additional shader units (see benchmarks below). Therefore, DirectX 10 games of 2008 should all be playable in high details. As with all cards with DirectX 10 capabilities, the GeForce 9800M GTX renders 3D images using "Unified Shaders". Dedicated pixel- and vertex shaders have been dropped in favor of stream processors, which have now taken up much of the rendering burden. Furthermore, the shader units are higher clocked than the core chip itself at 1250 MHz. A feature found in the GeForce 9000 series is the integrated PureVideo HD video processor. The GPU is able to assist the CPU in the decoding of H.264-, VC-1-, MPEG2- and WMV9 video material. In conjunction with the Nvidia 9100M G integrated graphics, the 9800M GTX supports Hybrid-SLI known as HybridPower. HybridPower is a technique available only in Windows Vista that allows users to choose between the integrated or dedicated graphics core for power-saving purposes. Eventually, graphics switching was seamlessly accomplished through drivers by Nvidia, a technology now known as Optimus. GeForceBoost is not supported with the 9800M GTX as there would be no performance gain when paired the integrated GPU. Compared to desktop graphics cards, the 9800M GTX should be a bit slower than the GeForce 8800 GT, which has a higher memory clock rate. The 9800M GTX was eventually succeeded by the GTX 260M. The latter is based off of the G92b core architecture and is produced in a 55nm fabrication process, leading to lower energy demands and heat dissipation.